Tell us about yourself! What do you do when you’re not traveling the world? Where do you live? 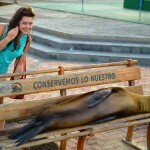 What made you decide to go to Ecuador and the Galapagos Islands? I’m a personal coach and business consultant, managing my three businesses while I travel. I’m mentoring and advising start-ups and entrepreneurs on how to build their brands and market their message to customers, I’m training new managers to become the leaders of the future, and I’m coaching people through their career transition from feeling stuck to finding work that is more meaningful and fulfilling. You can visit my website or follow me on Twitter. In terms of where I live, I can now officially say that I’m nomadic, without any home base at all. I do tend to come back to the UK, to my parents’ house in the south where I currently have my boxes up in the attic, and to my sister and her family to spend time with my niece and nephew. I also spend a lot of time in Sweden, one of my favourite places in the world (my parents are Swedish, though they’ve lived in the UK my whole life). Ecuador attracted me for two main reasons: first, for being able to stand physically on the equator, and, second, for the opportunity to visit the iconic Galapagos islands. I was in Ecuador for just over two weeks. The first few days I spent in the capital, Quito, where I visited the Ciudad de la Mitad del Mundo, just north of Quito, which is a complex of museums, shops and restaurants based around the line of 0 degrees latitude. Unfortunately, the advent of GPS has revealed that the actual line is some 240m to the north of this line. A fact that a separate institution, the Intañan Solar Museum, has used to its advantage in claiming to be built on the true Equator. Here, they let you carry out the infamous experiments that purport to show the physical consequences of being located at the exact mid-point between the North and South Poles: balancing an egg on a nail is supposed to be easier as the gravitational pull is weaker; water drains straight down out of the sink since the centrifugal and centripetal forces cancel each other out; and trying to walk in a straight line along the Equator with your eyes closed would have us all failing a drunk driving test as the confusing effect on your body allegedly makes it almost impossible. I then headed off on a catamaran for an eight-day cruise around the southern islands of the Galapagos. Life on board the Nemo II was incredibly relaxed, with everything taken care of, and just the right balance of organised activities and alone time. We’d have an excursion in the morning – a visit to one of the islands to see marine iguanas, crabs, tortoises, sea lions (lots of sea lions!) – and one in the afternoon – another visit ashore and then a session of deep-water snorkelling. Finally, I travelled back to the mainland and continued on to northern Peru, via the city of Cuenca, home of the Panama hat. I think the snorkelling would have to be my most memorable experience. Swimming in these waters was like swimming in a massive aquarium. On our first outing, I saw a school of small fish swimming by, shining a blueish silver; countless other species in blues and yellows and greens and oranges feeding on the coral; a group of eagle rays soaring majestically past; and beneath us, the sharks passing back and forth, seemingly unconcerned by the strangers above. On subsequent excursions, the captain of the Nemo II had a mad tendency of swimming into dark caves and then signalling to us if there were sharks. On one swim, I finally saw the hammerhead. On another, we frolicked with the sea lion pups (but beware the adults, who can be aggressive). Of course, when I found myself swimming with sharks, I couldn’t help but repeat: “Fish are friends, not food.” (Or better: HUMANS are friends, not food.) And swimming alongside the giant sea turtles, I swear I heard them say, “Duuuude”. I’m sorry Mother Nature, but Walt Disney & Co (in this case the characters in Finding Nemo) have contributed significantly to my education on the world around me. Then there were also the human stories. There is Charles Darwin, of course, and the buccaneers, along with a great Agatha Christie mystery tale of murder and deceit among three European families who came here in the 1930s. At Post Office Bay, I left two unstamped postcards in a barrel to be delivered by hand to their respective destinations in the United Kingdom – a tradition started in the 1700s at the time of the whalers. They haven’t arrived yet, so let’s see! Honestly I didn’t really miss any information – though reading more about Charles Darwin couldn’t hurt ahead of a trip to the Galapagos! I’d definitely recommend visiting the Museo del Sombrero in Cuenca, on Calle Larga 10-41. The museum has a huge Panama hat on the front so it’s hard to miss. Inside is a small but informative museum where the guide took us through the process of weaving, moulding, and ironing the hats. Most importantly, he explained that these are NOT, in fact, Panama hats. Produced in Ecuador as early as the 17th century, these straw hats went via the Panama Canal before being exported worldwide, picking up the name ‘Panama hats’ since they lacked any ‘Made in Ecuador’ marking to communicate their true origin. Their correct name, according to our guide, is ‘sombreros de paja toquilla’, after the name of the plant used to make them. The museum is housed in the Rafael Paredes hat shop and there is a huge range to choose from once you’ve been convinced of their authenticity on the tour. First you must identify your size. Mine is XXL – tengo una cabeza grande–but I knew that already. Next is the quality: standard, osemi-fino, fino. The cost can range from $28 to $2,000 – the former takes two days for the women to weave, the latter several months, due to the fine nature of the fibres. The colour: natural or bleached to blanco. The style: a classic Panama shape, something with a larger brim for the beach, or something smaller for city life. And finally embellishments: the standard black ribbon or something more unique? This was my first time travelling for such a long time by myself. When people first heard the news back in Geneva, I was told I was “courageuse”, “brave”. I did start to feel a bit nervous – excited – as the start of the trip approached, and I was quite apprehensive when the organised trip around the Galapagos ended. But once I was left alone, I just got in with it. It was something I had wanted to do: have some me time. Time to think, time to experience things on my own terms, time to meet new people, and time to write. In terms of specific advice beyond the obvious, I would repeat the recommendation that I found online (for both men and women in fact) to book with the high-end bus companies for long-distance and overnight journeys. These buses are decent and quite cheap considering the distances you’re covering. Most importantly, they have safety measures in place, such as setting a strict speed limit for the drivers.